Double-paned windows helped prevent the fire from getting inside the church, the pastor said. A two-alarm fire damaged the exterior of a historic church in Saugus Friday afternoon after several wooden and plastic paletts caught fire, a fire official said. Firefighters responded to the First Congregational Church at 300 Central St. at about 4:05 p.m., Saugus Fire Captain Tom Nolan said. 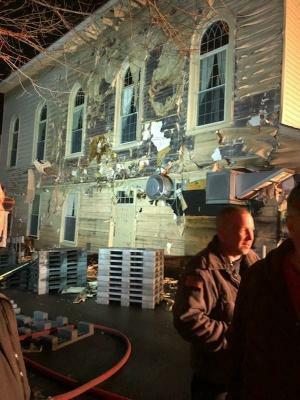 There was “extensive damage” to the siding, and the church was left without electricity, Rev. Martha Leahy said in an e-mail Friday night. “The entire back wall, by the back entrance to Community Hall, went up in flames,” Leahy said. No one was inside the church at the time of the fire, Leahy said. No injuries were reported. Two of the church’s second-floor windows were broken, and one was cracked, Leahy said. There was no estimate on damages. The cause remains under investigation, according to Nolan. The First Congregational Church, founded in 1737 in another location in town, is the oldest church in Saugus, Leahy said. It moved to Central Street in 1852, she said. It’s not known if the church will be able to host services Sunday, and officials are exploring possible alternative locations, Leahy said. She added that she was thankful for the Fire Department’s efforts. “Please say a prayer of thanksgiving for the quick response by the Saugus FD and for the speedy recovery of the church,” Leahy said.